The Laetitia Sadier Source Ensemble is a great argument for the type of experimentation that only comes from a solid knowledge of music history and decades of experience making it. That there was a 1990s-era ’60s revival is a bizarre fact to remember now. This scene wasn’t necessarily real—there weren’t too many Twiggy look-alikes with Mary Quant–painted faces walking around London in A-line dresses and vinyl boots, despite what the video for “Groove Is in the Heart” might have told you. But the advertising, the design, and the magazine editorials were real. Silly things like the Austin Powers movies or the Volkswagen New Beetle might be the most lasting contributions of that revival to the collective unconscious. One of the more subtle parts of it—a very real musical genre of throwback art-pop—has had a surprisingly long shelf life. Its leading practitioners were Laetitia Sadier and partner Tim Gane, who started both a band, Stereolab, and a record label, Duophonic, to spread music that cribbed from the garage-rock, psychedelic, and sophisticated-pop movements of the past. Stereolab’s music created a world where pop and experimental impulses cohabited well, if tensely. The extremely apt song title “Space Age Bachelor Pad Music” was a joke in its original conception, but eventually came to stand in for their contribution to the retro-futurist scene in the 1990s. To do this, Stereolab combined sophisti-pop and psychedelic ideas with the spirit of space films and sounds borrowed from 1970s Kraut rock—a guttural, charging, and monochromatic genre of German music. They made music that would have worked perfectly in everyone’s imagination of a ’60s dinner party in a Bauhaus apartment. Sometimes this resulted in tight pop, other times in ambient, meandering set pieces. The recognition that Kraut rock and psych-pop have a lot in common is not an obvious one, but it was this working knowledge that allowed Stereolab to make more serious and intense music than you might have associated with pop from the ’60s. After two decades of releasing music in this vein, Stereolab broke up in 2010. In the music Sadier has made since, she’s explored questions of politics, love, and metaphysics, but one question always looms in the background: What is the future of retro-futurism? Indeed, how do you continue to make new music when you’re mining from the past? On this month’s Find Me Finding You, her first album with a group she’s calling the Laetitia Sadier Source Ensemble, she takes the question head-on. 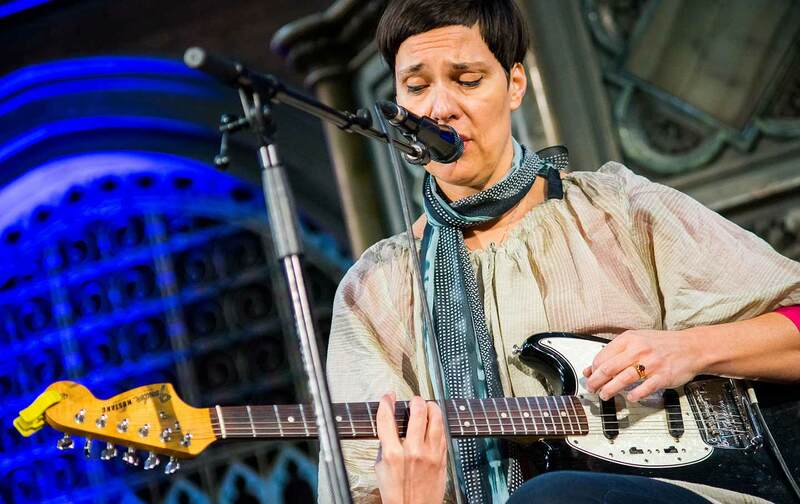 Because she’s a real indie-pop workhorse, Laetitia Sadier is the loudest voice from the old scene still making music. Counting all of her projects—solo, as a part of Stereolab, and a few other collaborations—this is her 29th full-length album in 25 years. The results of this new alliance are far more than additive, and Sadier proves the well isn’t running dry. Rather than simply filling out her songs, the Ensemble functions as a true cooperative, giving them an articulation and dimensionality they might not have otherwise. Sadier’s always been able to write a great song, but the line between the sparkly gems and the more experimental set pieces was previously very sharp. On Find Me Finding You, the music feels more emergent than constructed—an isolated rhythm or instrumental line will fall in line with another, and more and more will pile on until some transcendent group motion catches. Perfected here are slow-core ballads that snap rather than wail, and they function as a sign that the band has incredible chemistry. Most notable is the way the songs use the particularities of each instrument and the spaces around the sounds they make. There are at least three pauses I would nominate as among the best in rock history, à la Jennifer Egan’s Visit From the Goon Squad. The album uses genre as a grammar, combining different preexisting sound ideas in logical sequences that nevertheless produce something meaningful and altogether new. There are plenty of nerdy moves on the edges: the perfect oscillating synths in the distance on “Deep Background,” the spot-on Led Zeppelin–style guitars that bay in “Reflectors,” the woodwinds weaving in and out of the album’s second half that seem right out of Nico’s Chelsea Girls. When I think of why Find Me Finding You is so affecting, I think of the emotional impact of similar experiments by the Carpenters in the 1960s. I’m sure I’m not the first person to experience dismay upon recognizing America’s middle-of-the-road darlings as essentially a psych-pop band. One of their earliest singles was a cover of “Ticket to Ride” by the Beatles, a joyous tune in Lennon and McCartney’s hands. Karen’s alto and Richard’s love for minor keys spin the song into something altogether different, a song about nihilism and the dark side of freedom. That a song can be so thoroughly changed by a key change and a yowl is an inadvertent reminder of the power of the psychedelic palette. And the conduction of emotion through chords and their relationships is something Sadier is great at—her aims are as psychological as they are musical. As a lyricist whose native language is French, Sadier tends to sing words that have resonance even if you don’t understand them. On “The Woman With the Invisible Necklace,” a keening guitar line, hand-clap percussion, and bells set the emotional tenor. When the climactic lines come (“We remain / We remain / Situational”), a sentiment that could appear in art theory becomes something more insistent. In that way, the Laetitia Sadier Source Ensemble is a great argument for the type of experimentation that only comes from a solid knowledge of music history and decades of experience making it. Sadier is an elegant magpie, cribbing casually and inventing on the fly. Hers is the type of music that rarely achieves commercial success outside of literally appearing in commercials, but it’s why independent rock chugs along in the background despite a multitude of social and technological changes. Retro-futurist pop continues to remind us that some ideas are best expressed through minor chords.